Question What do Peter Straub, Caitlin R. Kiernan, Brian Evenson, Henry Kaiser, Gene Wolfe, Hal Duncan, Jeffrey Ford, Rikki Ducornet, Holly Phillips, Stephen R. Donaldson, K.J. Bishop, Michael Swanwick, Ellen Kushner, Daniel Abraham, Jay Lake, Liz Williams, Tanith Lee, Sarah Monette, Conrad Williams, Marly Youmans and sixty odd other contributors have in common? Answer They were all asked the following question: What is Last Drink Bird Head? Each of these writers considered this question in mandatory seclusion and, after literally many minutes of thought, wrote down their answer in 500 words or less. If you’re thinking: this sounds like the sort of crackpot scheme that Jeff and Ann Vandermeer would cook up, you’d be spot on. And you’d also be right in supposing that they’d enlist the talents of their regular artistic comrades – Scott Eagle, Eric Schaller and John Coulthart – to turn their crackpot scheme into a stunning looking artefact (that also functions as a flip book!). And while you’re riding the Supposition Express, let’s take it to the terminus of logical conlusion. Given only the tiny germ of those four words to work with, every single writer has come up with something unique. These stories are surprising and powerful and entertaining and funny and…well, yes, short. And best of all – it’s all been done in support of an excellent literacy charity. 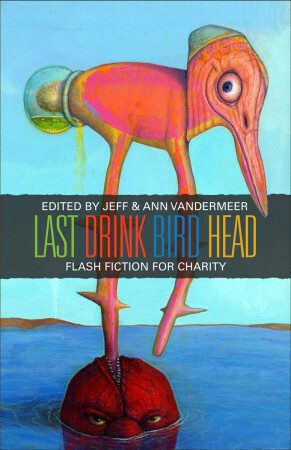 Last Drink Bird Head is being launched at the World Fantasy Convention on October 29th, and I’ll be picking up my own copy of what is certain to become a hugely collectible item there. If you’re going, I’ll no doubt see you there, but if you can’t make it you can pre-order the book direct from the publishers at a $5 discount. You want a sneaky peak to see what I’m talking about? Check out this Last Drink Bird Head action, right here for Astounding! Images! and Tantalising! Excerpts! What’s that? What was my answer to the question? Well, I’m flattered you should ask, but all I can say is it surprised me as much as anyone. Here’s a taster, but you gotta buy the book to find out what it means. Margueritte reties her cloak, clutches the flask, and climbs. The steps are slick, but the tread is deadened by gravel and ash, supplemented by ropes of wrack, screes of shells and delicate bird bones. Her steps crunch only softly. Buoyed, she runs, reckless of the wind, but as she ascends she gains gravity. Wrack pops, shells crack, bones snap. A gust billows the cloak into a sail, but she’s still too heavy. Margueritte’s instinct is split: to control the cloak or to let it flap and drink from the flask. Safety wins, and only once she is secure does she heft the flask. Just a drop and save what remains.